During October 2013, the sun continues to rise farther south of east and set farther south of west. The northern mid-latitudes lose about 1 hour and 25 minutes of daylight during the month so that at month’s end the sun is in the sky for about 10 hours, 25 minutes. At the full moon on the evening of October 18, 2013, the moon passes through the outer part of our planet’s shadow for a penumbral eclipse of the moon. The event will not be striking as when the moon crosses through the shadow’s darker core. The eclipse begins at 4:50 p.m. CDT, nearly an hour before moonrise which occurs at 5:56 p.m. CDT in the Chicago area. 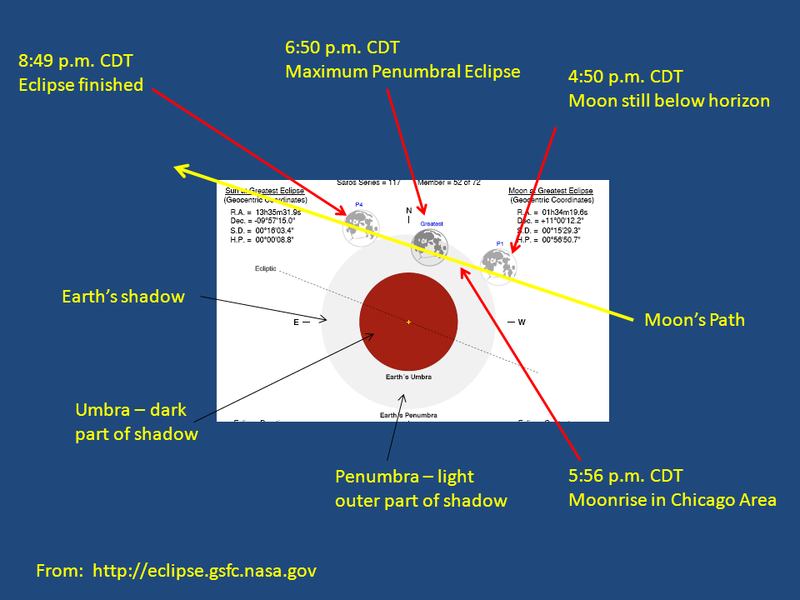 The moon reaches its maximum eclipse at 6:50 p.m. CDT. In the Observer’s Handbook 2013, expert eclipse observer Fred Espenak advises that “the beginning and end of a penumbral eclipse are not visible to the eye. In fact, no shading can be detected until about 2/3 of the moon is immersed in the penumbra” (p. 132). This would occur from 6:30 p.m. CDT to 7:10 p.m. CDT. Elsewhere in the publication Roy Bishop is more pessimistic about seeing the eclipse. He writes, “Such an eclipse is only of academic interest, since it will all but impossible to detect” (p. 116). We report the event here because some evening newscaster will certainly proclaim it a “superboomshakalakaeclipseneverseenbefore” moon, yet most will be disappointed by another over-hyped astronomical event they could not see. For easy viewing, Venus is an easy catch. Venus continues to dominate the evening sky as it outshines all other objects besides the sun and the moon. It is easily mistaken for an airplane or some other “unexplained phenomenon.” During the month, Venus’ setting time compared to the sun increases by about 30 minutes. By month’s end, it sets about 2 hours, 20 minutes after the sun. Early in the month, the crescent moon moves through the region. Look for the grouping in the west around 7 p.m. CDT. On October 7, the moon is 8 degrees to the right of the moon. Antares is 10 degrees to the upper left of Venus. The next evening the moon is 7 degrees to the upper left of Venus. Venus continues its eastward orbital motion passing near Antares at mid-month. 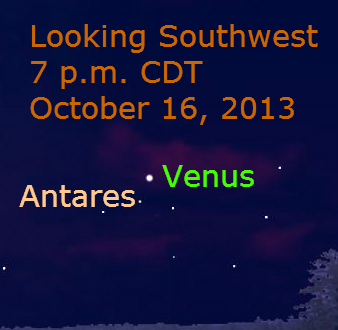 On October 16, Venus passes 1.5 degrees ((3 full moon diameters) to the upper right of Antares. Mercury makes an appearance early in the month, although it is difficult to see. On the evening of October 6, look low in the southwest for a crescent moon during bright twilight at around 6:45 p.m. CDT in the Chicago area. 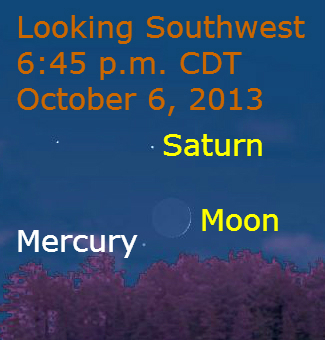 Mercury is 2 degrees to the lower left of the moon and Saturn is nearly 4 degrees to the upper left of the moon. A clear horizon is needed to see this and while occurring during bright twilight, binoculars or a spotting scope may be necessary to see Saturn and Mercury. 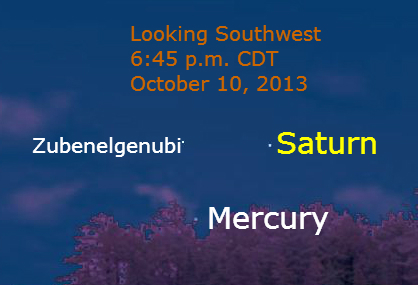 On October 10, Mercury makes its closest approach to Saturn. On this evening the two planets make nearly an equilateral triangle with Zubenelgenubi. Saturn is about 5.5 degrees to the upper right of Mercury and the star is about 4 degrees to the above Mercury. Saturn and Zubenelgenubi are about 4.5 degrees apart. Afterward, both planets disappear into bright twilight, appearing in the eastern morning sky next month. Jupiter is the bright morning planet well up in the eastern sky before sunrise. It rises in the east around midnight early in the month. Each week it rises earlier and by month’s end it appears in the eastern sky around 10 p.m. It shines among the stars of Gemini. Mars is the second morning planet. It rises in the east around 3 a.m. at the beginning of the month shining among the stars of Leo. 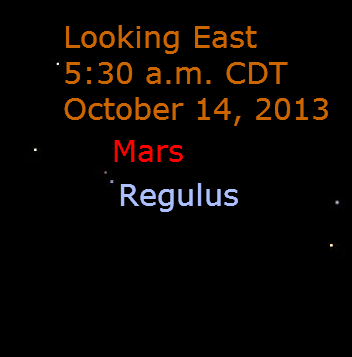 On October 14, Mars passes 1 degree to the upper left of Regulus. Look low in the east at 5:30 a.m. CDT. 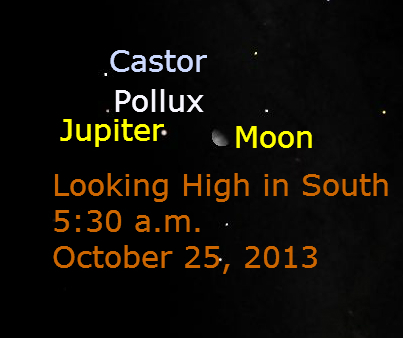 On the morning of October 25, the waning gibbous moon appears near Jupiter. On this morning, Jupiter appears 7 degrees to the right of the moon. Late in the month the crescent moon appears near Mars. 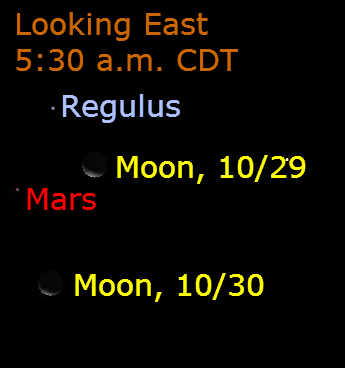 Look east at 5:30 a.m. CDT on the mornings of October 29 and 30. 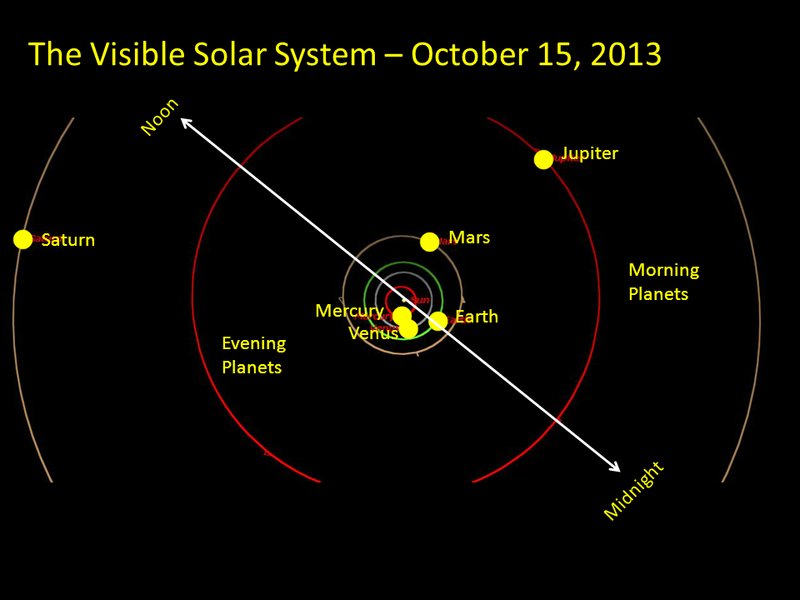 The chart above shows the visible planets on October 15, 2013. (Click the image to see it larger.) It shows the planets as viewed from above the solar system about from 90 times the earth-sun distance. Notice that no planets are visible at midnight. Jupiter and Mars are on the morning side of Earth while Venus, Mercury and Saturn are on the evening sky.